Be the first to share your favorite memory, photo or story of Blake. This memorial page is dedicated for family, friends and future generations to celebrate the life of their loved one. 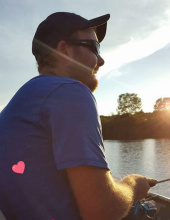 Blake Nathaniel Perry Wilson, 25, of rural St. Elmo, died at 8:50 p.m., Tuesday, January 15, 2019 at HSHS St. Anthony’s Memorial Hospital, Effingham. Funeral services will be at 1:00 p.m., Monday, January 21, 2019 at First United Methodist Church, St. Elmo with Dan Laack officiating. Burial will follow in Pleasant Grove Cemetery, rural Moccasin. Visitation will be from 4-7 p.m. Sunday, January 20th at the church. Memorials may be made to the family. Gieseking Funeral Home, Altamont is assisting the family with arrangements. Blake Nathaniel Perry Wilson was born on Monday, November 1, 1993 in Springfield, IL to Jennifer L. Myers and Edward W. Wilson. He married Bridget Gottman on September 21, 2013 at Zion Lutheran Church, rural Altamont. He was in the class of 2012 in St. Elmo. He was a member of the First United Methodist Church, St. Elmo and employed with the Y-Yard Auto & Truck, Watson. He is survived by his wife, Bridget Wilson, St. Elmo; children, Brookelynne Elayne, Braxton Elliott Nathaniel David and Brenner Edward Dean, all at home; sisters, Megan Taplin, Charleston and Audrey Burgess, Altamont; mother, Jennifer (Shane) Burgess, Altamont; father, Edward (Crystal) Wilson, St. Elmo; father, Shane (Lori) Taplin, Wright’s Corner; mother-in-law, Jodi (Thomas) Graumenz, St. Elmo; father-in-law, Chuck Gottman, St. Elmo, paternal grandmothers, Ruby Wilson, St. Elmo and Linda Brock, Effingham; paternal grandfather, James (Pam) Brock, Kansas City, MO; step-siblings, Nick (Sam) Wright, Spirit Lake, ID, Zach (Shelby) Wright, Altamont, Justin (Kelsey) Crum, St. Elmo, Candace Crum, St. Elmo, Courtney Heath, Tempe, AZ, Wyatt Heath, Wright’s Corner, sister-in-law, Dara Ledbetter, St. Elmo; brother-in-law, Lucas (Megan) Ledbetter, Brownstown; Godparents, J.J. and Cheryle Goldstein, Altamont; 12 nieces and nephews, Abbi, Mario, Eli, Drake, Arabella, Ava, Aubree, Christian, Wyatt, Arianna, and Haegen, one on the way. Blake was preceded in death by his maternal grandparents, David and Virginia Myers and paternal grandfather, Leland Wilson. To send flowers or a remembrance gift to the family of Blake Nathaniel Perry Wilson, please visit our Tribute Store. "Email Address" would like to share the life celebration of Blake Nathaniel Perry Wilson. Click on the "link" to go to share a favorite memory or leave a condolence message for the family.